Until 2 October, Born in Antwerp unites creative people so that they can inspire each other and exchange ideas and visions in order to start creating things together. The Antwerp creative scene is very rich and diverse. Did you know that one out of six Antwerp companies is active in the creative sector? The city is an immense creative hub with international appeal. In Antwerp, there has always been a lot of space for innovation, ever since Christophe Plantin in the 16th century. Today there’s Tomorrowland, the internationally acclaimed software company Drupal, and many world-famous fashion designers. “Born in Antwerp” wants to tell the story of the city as a natural habitat for all kinds of creativity. 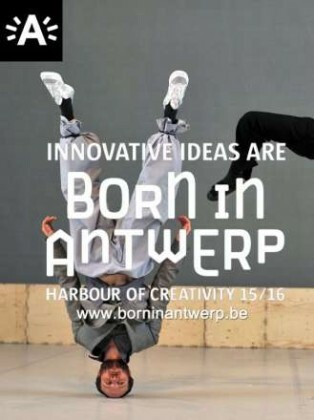 “Born in Antwerp – Harbour of Creativity” kicks off in December 2015. The apotheosis of this creative year will be a four-day festival in September 2016, during the re-opening of the Plantin-Moretus Museum. You can check out the program as it is today on www.borninantwerp.be. All Antwerp-based creative and cultural entrepreneurs are kindly invited to cooperate on this ambitious program by means of their very own projects. All you have to do, is contact info@borninantwerp.be. What are you waiting for? The epicenter of the creative project will be a specially equipped warehouse at the Kattendijkdok-Oostkaai. This will be the place to be for creative events, performances, lectures and expositions. It will also be a meeting hotspot, an inspiring place to work or a space to gather with friends. The Antwerp creative scene will be able to use it to organize events for the public.